Winter weddings are in full swing, offering a new array of floral options. Traditionally, Winter weddings have been limited to icy bright whites, however, 2012 opens many new doors. 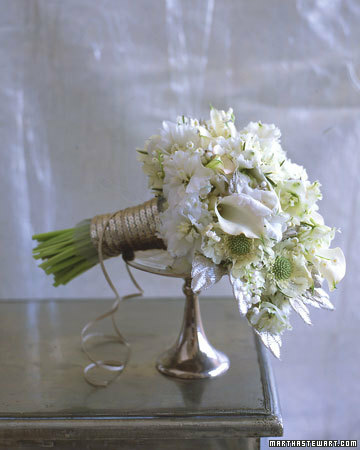 This year’s popular trends include slightly antiqued bouquets that consist of cream and ivory tones. 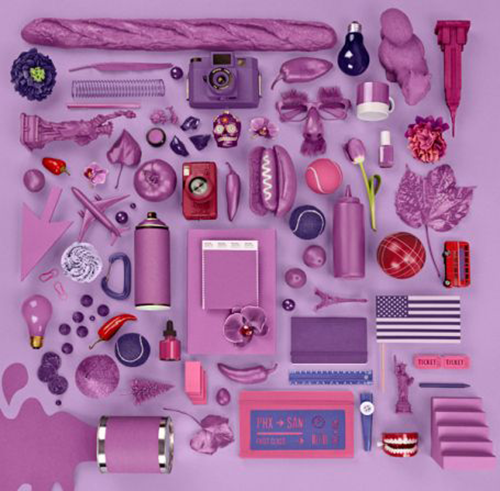 Also, instead of rich reds and deep greens, muted accents like mauve or olive are more likely to be seen. Winter also allows unique textures and seasonal elements in order to make a one of a kind bouquet. Lambs ear, pinecones dusted in glitter, and berries are all popular choices this season. Common Winter wedding flowers include calla lillies, orchids, and tulips for the base of the bouquet, while roses and miniature paperwhites often act as accents. Many times these bouquets are tied together with a velvet bow or sequenced ribbon for added elegance. Winter allows variety and texture making the season’s bouquets absolutely beautiful. Having trouble finding the right flowers? Check out this flower guide! 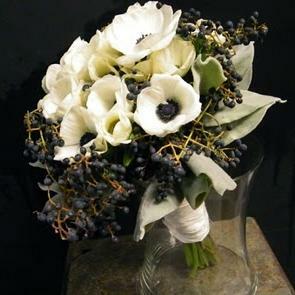 If you are looking for a wonderful florist, I have to say that Bloomtastic is the best! I may be a bit partial since they did my wedding, but I think they are great. 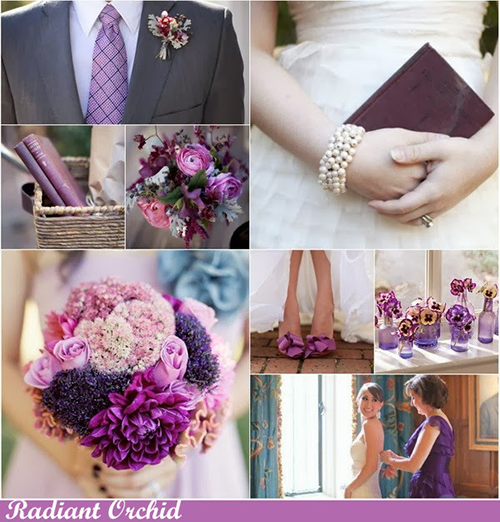 They entire staff is very knowledgeable and are willing to give you great ideas that fits with your theme and budget. 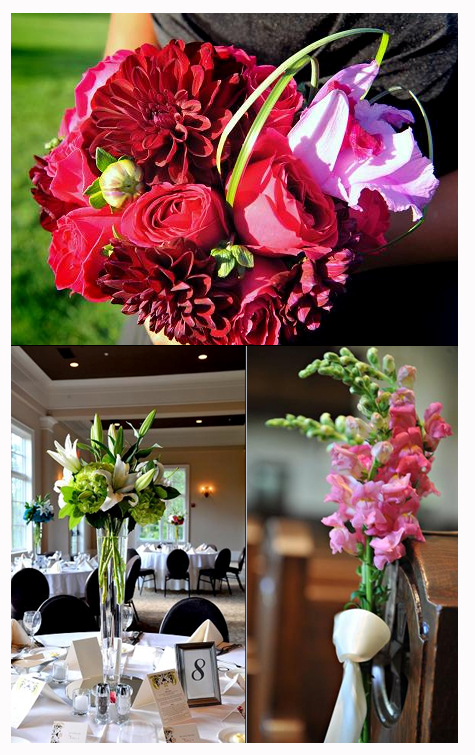 Here are some pictures from a recent wedding from Bloomtastic. 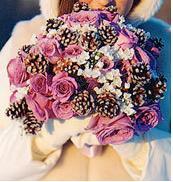 The bride’s bouquet was designed of roses, carnations and cymbidium orchids. Bridesmaid’s bouquets were designed of dahlias, roses and cataylea orchids. The centerpiece was hydrangeas and oriental lilies. Breathtaking! Got a lot of mismatched stemware? Prefect! 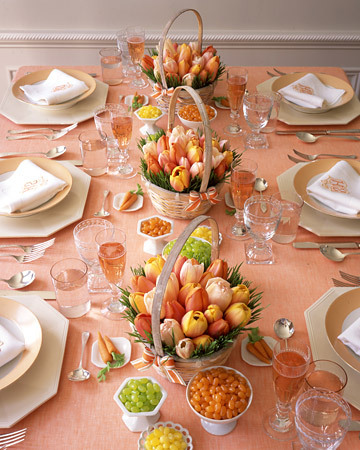 Then you can have a cheap and beautiful table arrangement for your next bridal shower or luncheon. If you don’t have the stemware, borrow pieces from other girls in the bridal party or hit up the local thrift store. Because, with just a few flips of the glass, designer Annie Selke—owner of home furnishings company Pine Cone Hill (pineconehill.com)—created a modern candle-and-flower arrangement that I absolutely love. 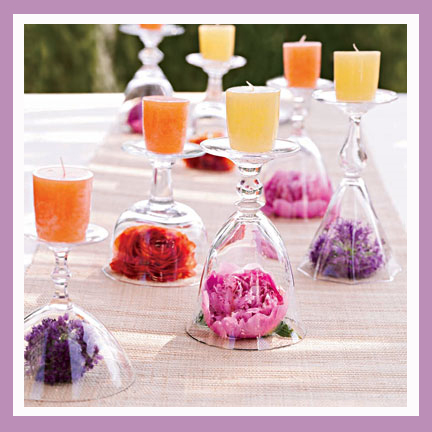 To achieve this look simply place your goblets upside down on a table, tuck large blooms underneath and top with colorful votives. It may only take a few seconds to pull together, but the elegant impact will last all night. Michelle Rago is known for taking their client’s wedding vision and transforming it into a breathtaking fantasy. This Vermont wedding is no exception. Every detail is well attended. From the woodland inspired decor to the soft combination of delicate flowers, it is simply perfect. 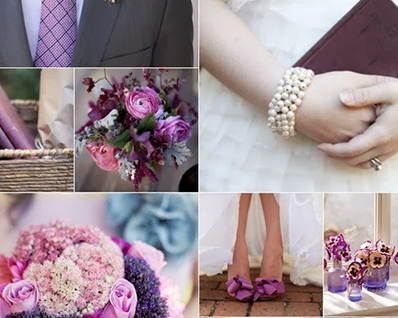 Check out our Country Wedding Pin Board for more rustic inspiration! Designer Lulu Guinness (luluguinness.com), famous for her whimsical accessories, put her usual flair on the table when she came up with this centerpiece—votive candles and a vintage mirror with lavender roses. To re-create the look, use your favorite flowers and any candles and mirrors. This centerpiece adds a touch of classic beauty to any wedding table. 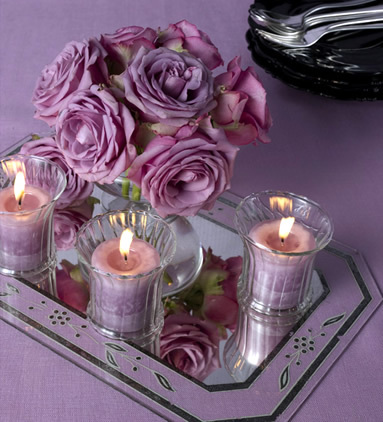 Plus, the purple color of the roses with the votives will leave your guests relaxed and in awe of the ambiance. Just in time for Easter or a spring themed wedding or shower! This beautiful design is courtesy of Martha Stewart. I love the clean fresh design of the flowers as well as the fun colors of jelly beans. These will give your guests something yummy to munch on while they are waiting! 1. Place a plastic liner inside a basket. 2. Press clumps of wheatgrass, with a bit of soil still attached, around the edges of the larger liner. 3. Place a second, slightly smaller liner inside the first liner to hold the wheatgrass in. 4. Pour water and cut-flower food into plastic liner. 5. Cut tulips about 2-inches from the head of the flower, and prick the stem with a pin or knife to prevent growth. 6. Arrange tulips in basket. Reduce, reuse, and recycle just took on a whole new meaning with South Carolina boys Matt and Ted Lee. The Lee brothers have made a career of getting back to good old American basics. To wit, they created this centerpiece right out of the canned-foods aisle. 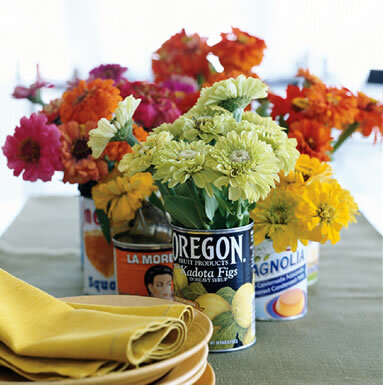 To re-create the look, choose retro-looking cans from your own market, empty them — to make a pie, perhaps — and fill them with small bunches of flowers. This idea is super simple and would be perfect for a vineyard themed wedding–you could even use wine bottles instead of cans– or even a country themed wedding. Depending on the cans you choose this idea would be a great money saver for a variety of weddings.The options and designs are endless! Isn’t that just canny? Sorry! I had to say it! Daring designer Genevieve Gorder works decorating miracles on The Learning Channel’s Trading Spaces , and she did the same with this centerpiece. If the design alone is not good enough,then the price will be. She made this arrangement for about $6! The ingredients: a cheap bunch of supermarket flowers, a bag of colorful dried beans and some tall glasses drinking glasses. Fill each glass with a 2- to 3-inch layer of beans and add a few tablespoons of water. 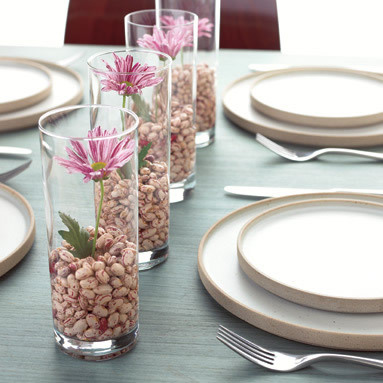 Trim one flower stem to fit inside each glass, then arrange the “vases” down the center of the table. Wah-La! You have a beautiful centerpiece at a fraction of a florist’s price! J-E-L-L-O, has been the catch phrase of Jello for years. I have seen many uses for Jello, from cakes, to salads, to drinks, but this is a new one. You can now use the jiggley mix to make a beautiful centerpiece for your wedding,wedding shower, or luncheon. 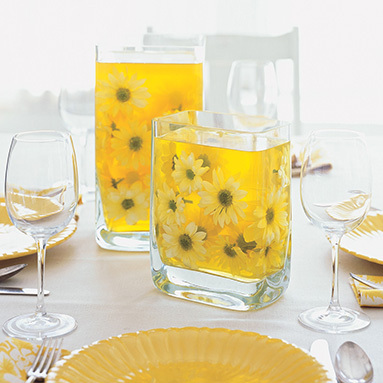 To create this look simply combine six boxes of Jell-O powder with half the amount of water specified, chill the mix in a glass vase for half an hour, then just push flowers into the semi-firm gelatin. You can design your own in any color!